Every year before our annual trip to Islamorada I do an assessment of my current gear collection that’s on the skiff. Tackle, gear, emergency supplies and everything else gets emptied and I sift through it all to make sure I have what’s needed for the trip. Besides ensuring that you have working batteries and gear that turns on when you need it to – having what you need for every situation that you could encounter is paramount. In my skiff, I use my ‘boat bag’ for this purpose. This article will go through everything that I’ve found necessary to being prepared and ready out on the water for any situation you may encounter from a simple need for sunblock to being stuck out on a mangrove island for over 48 hours. The image above is the basic loud out of my front hatch. 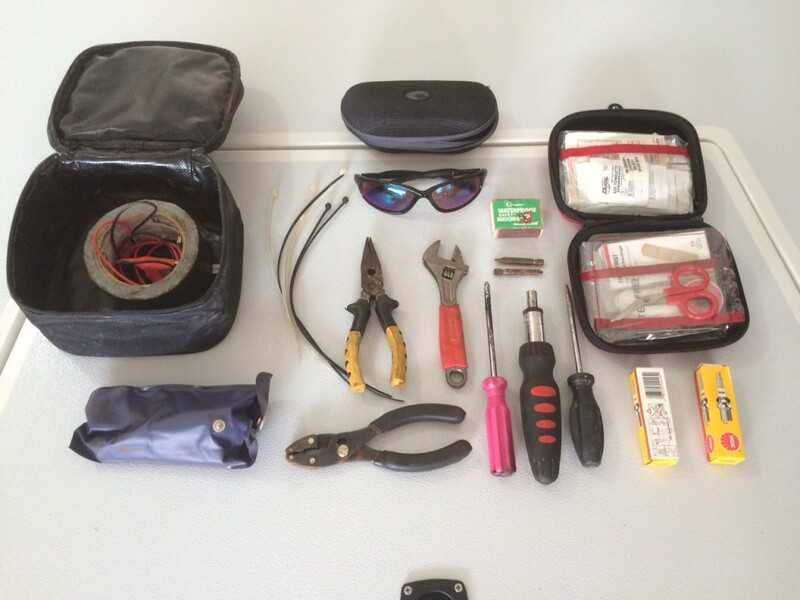 All of these items are part of my ‘boat bag’ but I have some of them removed from the bag for quick access. You never know when you’ll need to get out and push. It’s my preference to skip the manly pep talk and put these water shoes on when slogging through oyster bars, mud, and sea urchins. Search Amazon for the right pair of water shoes. Ever been running full speed and have a gust of wind from some random direction that was never in the forecast? Yep, all the time! Keeping a spare hat in your bag/hatch can save the day when the one you wore that morning goes flying off into the sea behind you. I posted about the most awesome knife in the world during a ‘Holiday Gift Guide’ I wrote for the site last year. These Swedish-made surgical-grade knives are always sharp and never rust. They are amazing and they’re less than $15 shipped on Amazon! A good pair of pliers on a boat is priceless. From removing hooks, to cutting line and maybe even a quick outboard adjustment – pliers get it done. My favorite has been the Mustad AL/SS series with the fancy heat-treated coating on it. Pickup a pair of Mustad AL/SS Coated Pliers here. Don’t burn to a crisp and regret it the next day…or get eaten by mutant horseflies. I carry two cans of sunblock and bug spray on the skiff loaded and ready to go. Two is one, and one is none. Always carry back-ups! My favorite back-up handheld GPS is the Garmin Oregon. It’s a touchscreen GPS with a 3-inch screen that takes SD cards for custom maps. Some of the Oregon line may be discontinued by Garmin, so check out this link of Oregon-model GPSs to see what’s currently available. 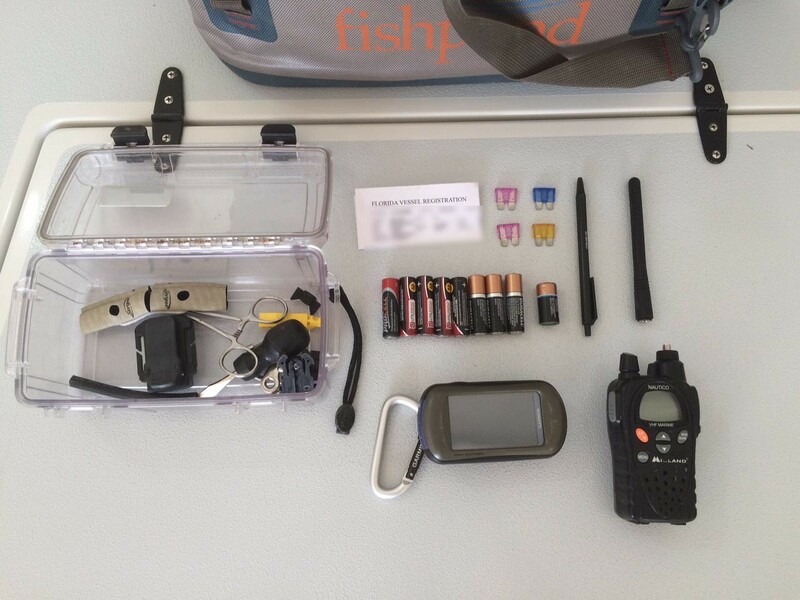 A VHF can be a life saver in an emergency situation…but I also like to keep my skiff clean of unnecessary electronics and gauges. My current favorite is the Midland Nautico VHF series. This handheld VHF comes with an antenna, battery back, 12v charger and basically any other accessory you’ll ever need to keep it running. Check out the complete Midland kit here! Spare batteries is a no brainer as they can die at any time inside a device or expire. I keep up to 8 AA batteries for my lights and handheld devices at all times. Randomness: Pens, Fire, and etc. ..and of course random stuff such as pens, a lighter for making a fire in case of being stranded on an island, screw driver…and fly line finger protectors? 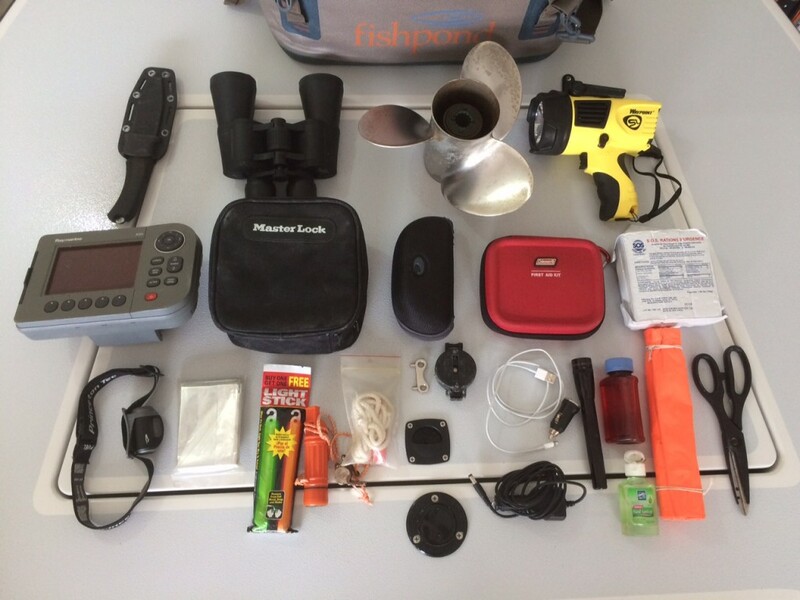 The image above is the basic loud out of my boat bag. Let’s sort through everything from top left to bottom right. As I said above i really can’t exude anymore praise for this knife, so I carry a second Morakniv inside my boat bag just incase I get attached by TWO 20-foot alligators in the same day. Duel-wield! You never know when you’ll need to view a marine sign or channel marker that’s across a flat you’re on, or have to check out who is actually running full speed on plane across the poll and troll zone so you can school them later at the boat ramp. A good pair of binoculars can be a huge help when trying to spot things from afar on the water. I use a pair I got as a gift, but you can see the selection Amazon has available at this link. Let’s face it. We all hit stuff sometimes. Sandbars, oyster bars and half-price happy hour bars – maybe in a different order. Having a spare prop can be the difference between spending the night out on the flat or getting back to the ramp. Want to know how I know you’ve never navigated your skiff at night? You don’t own a good spotlight. The Streamlight ‘Waypoint’ spotlight is the baddest mamma-jamma of all marine spotlights. Streamlight makes military-grade weapon lights for our heroes overseas, so it’s only fitting we use the best for our skiffs as well. This spotlight takes 4 C-cell batteries AND has a 12v power cord for those emergencies where the batteries have died while in storage. Get the baddest spotlight of all here! Your main GPS. Nothing much to see here, I only use it on vacations when I’m not in my backyard so into the boat bag it goes. This here is how we’ll survive the skiff apocalypse aka getting left high-and-dry in the middle of the everglades. I mean, yes, we COULD make snook or redfish ceviche and what-not…but I don’t have any spare lemons or bell peppers laying around. We could also forego the fancy ceviche and just start a fire somewhere and cook some fish – but stop ruining my fun. This company by the name of S.O.S. makes a vacuum sealed 72-hour food ration that is good for 5 years of storage! Keep this in your boat bag for that one time you’re stranded and forgot your dinner…or if you’re just really hungry one day and feel like eating space food. Find this 72-hour food kit on Amazon here. An LED headlamp is great to have not just for an emergency outboard repair at night – but also tying on a new fly or spoon in the wee hours of the morning. Guess what? Amazon has a great selection here and you can support this website by using this link. Thermal blankets can be great if you’re stranded out on the skiff during the winter but also have many other uses. From being a shiny signal device to also making a makeshift shelter…they’re a cheap addition to the boat bag with nothing to lose. There’s a great deal right now for a 10-pack of these for $6.99 shipped! The basics of safety. Whistle and light sticks. You can find these pretty much anywhere and can be a Godsend on the water when in need! Ever have your battery die on the water? Having your outboard’s applicable manual rip cord can get that sub-90 horsepower outboard going again to recharge the battery on the way home. Yes- I’ve used it plenty of times. Another staple of navigation. A manual compass to show you where the heck you’re going out on the water. If you have a auxiliary 12v outlet installed on your skiff, having a USB adaptor and your cell phone’s required charger will save you in a pinch. If you’ve been taking hero shots of fish and using your Google maps to hotspot your friends all day – then this is the best way to get your phone back up to 100% battery in no time. Once again we have a two is one and one is none situation. Always carry multiple flashlights! Here’s an oddball many people might not have thought of. The orange medicine bottles are water-tight and can be refilled for random use. Ever cut yourself out on the water? Ever cut yourself out in dirty brackish soup water trying to chase stupid baby tarpon? This is the best way to clean out wounds on the water before they get infected or before that skin-eating bacteria can get up into your bloodstream. Don’t be a hippy, wash your hands! Randomness: Scissors, Emergency Flag, and etc. A few more staples of boating safety here such as the emergency flag which is required by the US Coast Guard. I also have a random pair of scissors for cutting things. You might get a boo-boo out on the water…or your friend might hook himself in the leg. You just never know! Keep a first aid kit handy in the skiff at all times. For good measure I add in a box of waterproof matches so I can start a fire if I’m ever stranded on an island before a tow can arrive. There you have it! 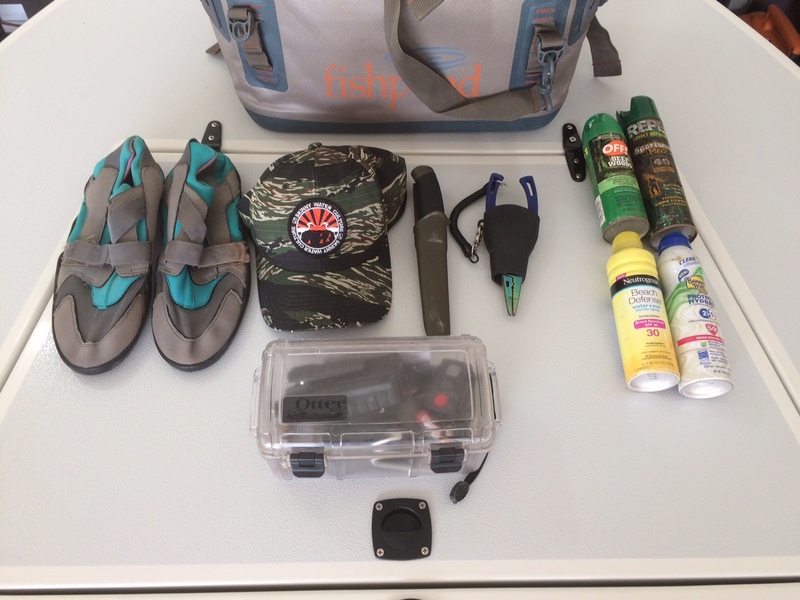 With these items you can be confident that you too can survive and be prepared for just about anything out on the water.